If you don't already know, Mango is our geriatric clinic cat who haunts our halls. He is generally grouchy and now he has a reason. 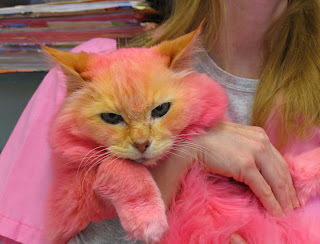 One of our kennel technicians decided it would be a good idea to color him red with a special pet dye. 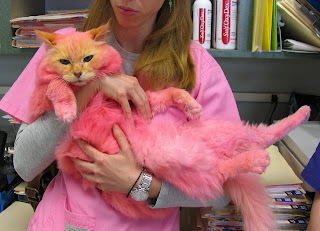 The only problem was that he turned out pink. Bright freakin' pink. I thought it was funny but our boss was NOT amused. Thankfully the color will wash out in a couple of weeks and Mango will be back to the regular programming. For those who are interested, there are other pet dyes available. Green, purple, and blue. It seems quite festive and I don't see why Mango would object to celebrating each holiday with a different shade.